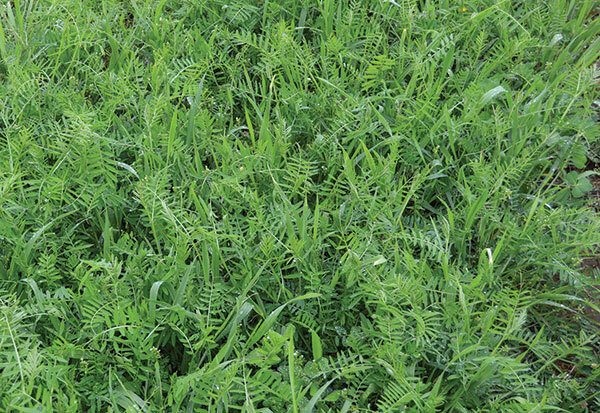 Legumes such as hairy vetch can improve the quality of winter annual grasses. The author is an assistant professor in the department of dairy science at Virginia Tech. Cover crops are planted to enhance health and fertility of soils and to benefit the surrounding environment. By covering the soil surface, cover crops reduce soil erosion caused by rainfall, water runoff, wind or their combinations. The mulch-like cover also limits the access of light, inhibiting or retarding growth of weeds. The root system of cover crops improves pore formation, which allows for water infiltration, soil aeration, and reduces soil compaction. Adding legumes to annual crops can increase nitrogen capture from the atmosphere. This process, known as nitrogen fixation, occurs through a symbiotic relationship between legume plants and bacteria from the soil. When left as cover or mulch, the biomass of the winter crop can provide additional residual nitrogen for the following crop. Alternatively, because winter annual crops are typically harvested as a forage source for feeding cattle in dairy farming systems, adding legumes to annual crops often improves the protein concentration of the forage. The use of annual crops in dairy farming systems for forage is typically oriented to winter annual grasses. As part of the Conservative Innovation Grant (CIG) Program at Virginia Tech, and in collaboration with the USDA-Natural Resources Conservation Service (NRCS), we evaluated how adding different legumes to annual grasses affected yields and the nutritional composition of winter crops for forage. We also evaluated the residual effects of the winter crops by measuring yield and forage quality of the succeeding corn crop for silage. For this study, five grasses (barley, rye, ryegrass, triticale, and wheat) were planted alone or in combination with each of two legumes (crimson clover or hairy vetch). Four replicates of each of the 15 treatments were planted at three Virginia Tech experimental stations. Plots were planted during fall 2014 and harvested during spring 2015. Forage dry matter yield trended higher when grasses were grown in combination with crimson clover but not when grown in combination with hairy vetch. Adding legumes raised protein concentration of the forage. Protein concentrations were 13.0 percent for grasses in monoculture, 15.5 percent for mixtures including crimson clover, and 17.3 percent for mixtures including hairy vetch. Adding legumes also reduced fiber concentration of the forage. Neutral detergent fiber concentrations were 49.7 percent for grasses in monoculture and 46.5 percent for mixtures. The concentration of sugars declined from 14.3 percent to 10.5 percent when grasses were grown in combination with hairy vetch. The concentration of sugars was not affected when grasses were grown with crimson clover (13.2 percent sugars). So far, these data suggest that adding legumes to grasses boosted yield and improved the forage nutritional composition. Harvested forages were also fermented in mini-silos to evaluate the effects of including legumes on silage quality. Including legumes raised the pH of the silages. In the case of hairy vetch, silage pH increased from 4.14 to 4.42, whereas for crimson clover silage pH rose from 4.14 to 4.20. Very likely, differences in pH relate to differences in sugar concentrations. These observations suggest that silage fermentation and conservation can be more challenging when including hairy vetch in winter crop mixtures. If hairy vetch is included in winter crop mixtures, the use of inoculants is strongly recommended. Same as for fresh forages, adding legumes boosted the protein concentration, especially with hairy vetch, and reduced fiber concentration. Adding legumes to the crop mixture did not affect the subsequent corn yield for silage. Plots containing ryegrass in monoculture or in combination with legumes tended to reduce corn yields for silage. These observations were attributed to the regrowth of ryegrass after corn emergence, which offered competition to the corn during early growth. Despite these differences, the nutritional composition of the corn plant was unaffected as reflected by the similar fiber concentration of the harvested corn silage. Including legumes with annual winter crops can enhance yields and quality of forages for silage. However, the impacts of these changes will be variable when formulating diets for high-producing cows, given that these silages will likely be mixed with several other feed ingredients. As a final remark, one frequent misconception is that winter crops are not beneficial to soil health in dairy farming systems because harvesting for silage does not allow for the mulching effect. Although true, winter crops destined for forage still promote soil health by controlling weed growth, minimizing soil erosion, and preventing nutrient leakage. Winter crops also benefit soil health with below-ground biomass development through root growth. This article appeared in the April/May 2016 issue of Hay & Forage Grower on page 20.